In today’s post, it is my pleasure to present to you what I consider to be one of the finest examples of early Depression-era jazz ever recorded. Two quite different, but both superb pieces played by a band billed as “King Carter and his Royal Orchestra”, which was in actuality a pseudonym for the always excellent (and unfortunately oft overlooked) Mills Blue Rhythm Band. Columbia 2504-D was recorded June 25, 1931 in New York City, and the orchestra includes Wardell Jones, Shelton Hemphill, and Ed Anderson on trumpets, Harry White and Henry Hicks on trombone, Charlie Holmes on clarinet and alto sax, Ted and Castor McCord on clarinet and tenor sax, Edgar Hayes on piano, Benny James on banjo, Hayes Alvis on string bass, and Willie Lynch on drums. George Morton provides the vocal on “Moanin'”. For these two sides, I found that my usual equalization hindered the crispness of the music, especially the trumpets and cymbals, so these transfers are presented straight off the record, no equalization whatsoever. I hope you’ll find the increased crispness outweighs the slight crackle. The first side of this disc introduces us to the sizzling hot, and also quite modernistic tune “Blue Rhythm”, a fitting title for this band, even if they’re not using their actual name. 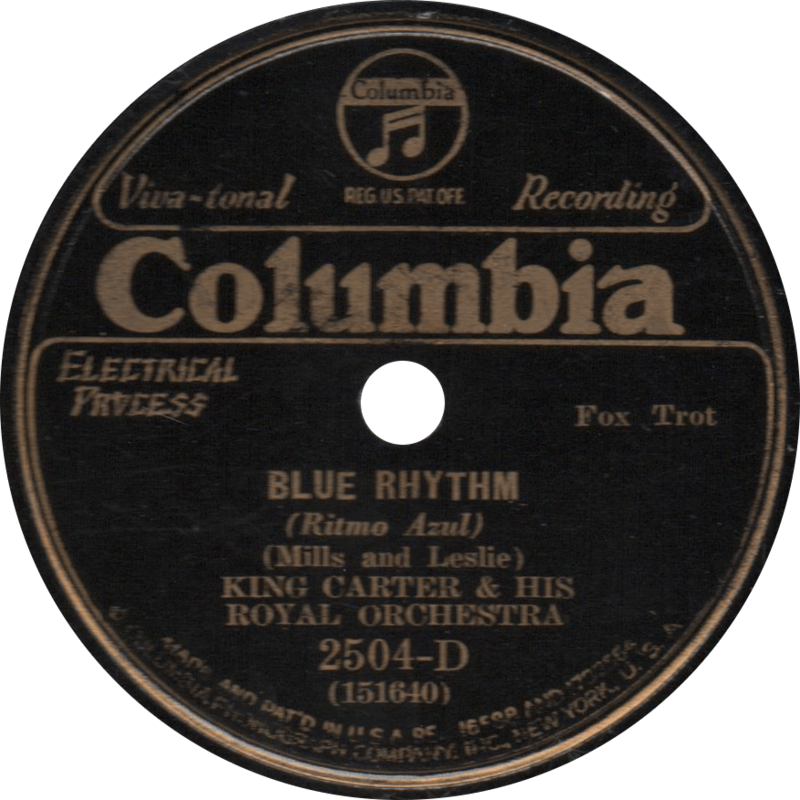 Blue Rhythm, recorded June 25, 1931 by King Carter and his Royal Orchestra. Don’t let the worn label fool you, the flip side, “Moanin'”, is in just as good or better condition. This side seems to have some kind of “wobbly” effect to it, it’s not a flaw with this particular copy, but is in fact a fault in the engineering, and is present on all pressings. Maybe the needle on the cutting lathe was worn out when it was recorded. For me, this side conjures up the images of sitting a smoke-filled Harlem jazz club in the years after the stock market crash, as swing begins to evolve from its primordial soup of hot jazz, taking it slow and easy as the fast paced world passes by outside the door. 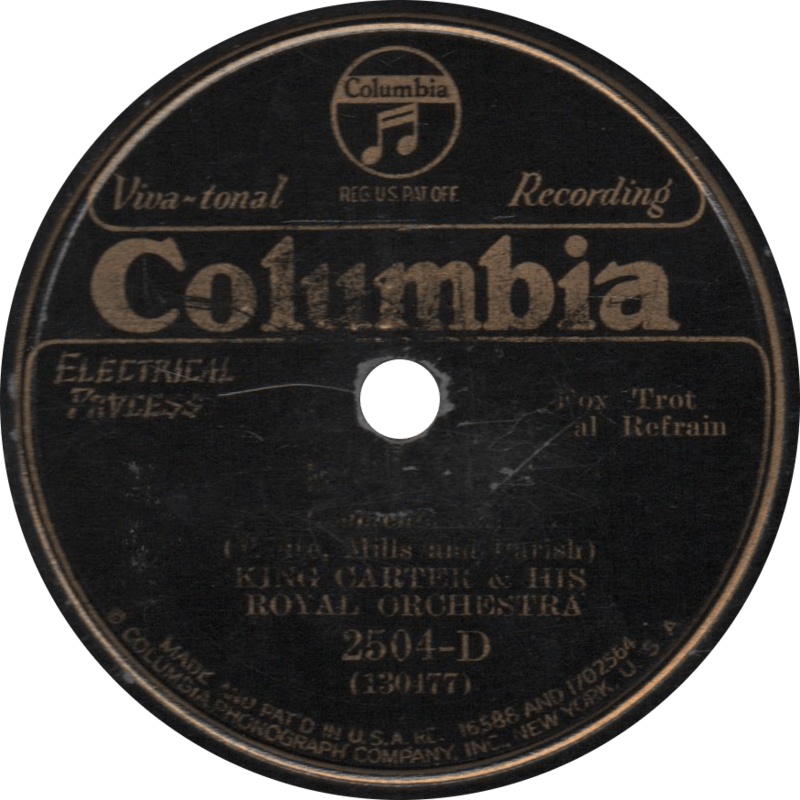 Moanin’, recorded June 25, 1931 by King Carter and his Royal Orchestra. This entry was posted in Records and tagged 1930s, 1931, Benny James, Castor McCord, Charlie Holmes, Columbia, Ed Anderson, Edgar Hayes, George Morton, Harlem, Harry White, Hayes Alvis, Henry Hicks, Jazz, Mills Blue Rhythm Band, New York, Shelton Hemphill, Ted McCord, Wardell Jones, Willie Lynch by R. Connor Montgomery. Bookmark the permalink. Where do you click to hear the music? I just get a close up of the photo. You have some great stuff here! The sound files are located under the label scans. If they’re not showing up, I’m not certain what the problem is, but I’d be happy to try to get it worked out. I fixed it, i had a “widget” call gravatar blocked on my end. Excellent, I’m glad to hear it’s working for you now. delighted to have found your post as I’m putting Moanin’ into my repertoire. It’s a fabulous piece. I’m having problems understanding the lyrics and was wondering if you could help me. Maybe you have better ears than I do! Thank you for your comment, and sorry for the short delay in my response. It’s hard to make out what lyrics Morton is singing, in fact they’re very nearly unintelligible, but I’ve tried to transcribe them. I can’t make any guarantee as to their accuracy, especially the third and sixth lines, but I hope they’ll be of some help to you. It is indeed a great song, whatever the lyrics are. Thanks so much for this. Rehearsed it last night with my band for the first time…. stunning song. My pleasure, I’m glad I could help, and I’m always thrilled to know that this great music is still being performed today.